Accept other believers who are weak in faith, and don’t argue with them about what they think is right or wrong. For instance, one person believes it’s all right to eat anything. But another believer with a sensitive conscience will eat only vegetables. Those who feel free to eat anything must not look down on those who don’t. And those who don’t eat certain foods must not condemn those who do, for God has accepted them. Relate: I miss bacon. I haven’t had a single piece of bacon in over a year now. In fact, apart from a couple short trips back to the US one last summer and one the year before, I haven’t had any bacon in well over three years. It isn’t that I have anything against bacon. Quite the opposite. I am thoroughly convinced that bacon will be a featured item at the marriage supper of the Lamb. (That’s the big feast we will all have in heaven at the end of time). It is just that, some things are more important to me than food and drink. You see, when I first moved here to Turkey, I decided that I would restrict myself to a Halal diet. In case you are wondering Halal is the Muslim version of Kosher. For the most part that means that I eat no pig products and drink no alcohol. The alcohol I could honestly take or leave. Not a problem. The bacon… not quite as easy. React: As much as I do love bacon, one thing I love even more is my neighbor. If God has called me to a country where 99.8 percent of the population is Muslim. If he has called me to a city with two million Muslims and less than 200 Christians, then He has decided that I could do without a little bacon in my life. Nobody around me actually demands that I conform to their dietary standards. They are often surprised to learn that I do. But they are also appreciative. It is one less wall standing between me and them. They are just a little more willing to hear what I have to say because they know just a little more that I respect them and what they do and believe. That alone is more valuable than mountains of bacon. What are you willing to put aside for the sake of the Kingdom? Are your rights and privileges and freedom more important than the gospel? Just because we can do something does not mean we should do it. For us, You set aside heaven to be born in a barn. You put aside Your rights to reside in glory to sweat and bleed and get sick and suffer and ultimately to be tortured and crucified. I want to be more like You. In a world where everyone is clinging to their rights and freedoms and privileges, help me to set aside them all so that nothing would stand between Your love and Your world. Let me be as radically concerned for them as You are for me. Even if that means I never eat bacon again. Excellent prayer! I used it, too. Thanks. I agree that “just because we can do something doesn’t mean we should” but I’m not sure I agree with your reasons. Thank you for giving me something to contemplate and take to the Lord in prayer. This is just one example that came to my mind: My mom is Catholic and chooses to not eat meat on Fridays…all year long…just because. I don’t now why…that’s between her and God I suppose. I actually live with her right now but in no way do I feel obligated to join her in that and I don’t believe God has called me to either. Maybe I’m wrong? I think it’s important not to mistake the form of action the adherent takes with the gesture of live and faith it represents. I don’t think a restriction on pork is any more “correct” than one on eating meat on a Friday. I do not follow those particular ideas, but I can understand the why. It is an act of loving submission to the higher power, to the Creator. When practiced as a private act between adherent and God, it’s beautiful. When turned into a social value that must be followed, it becomes an ugly, manipulative human construct. From my experience living in a Catholic dominated Northeast US, “fish Fridays” is in no way close to the way dietary regulations are connected with identity for Muslims and Jews. For me here, there are so many ways in which there are cultural barriers I cannot avoid that I will do everything possible to remove any barriers I can. For you it might be something completely different. What can you do, or stop doing, so that you can be a better friend and neighbor for your neighbors and coworkers and yes, your mom? The core idea is to have a mindset to putting others “needs and rights” before your own for the Kingdom’s sake. 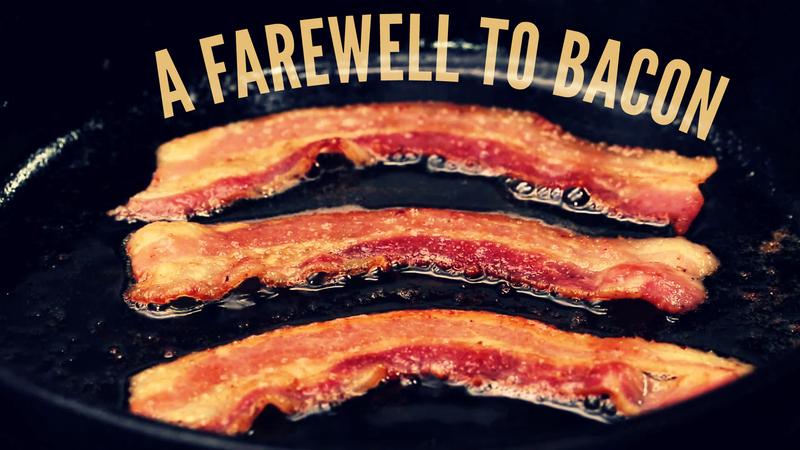 You are saving your heart and arteries and adding 10 years to your life without bacon. Nice. God bless you and keep you safe. I’m a little surprised that no one brought up eating turkey or “fake” bacon. Or is it too obvious that doing that is a fake sacrifice? Last summer I had the opportunity to go back to NY for a short visit. My mom picked me up from the airport and before we made it home I had a baconator from Wendy’s and then we grabbed a couple 2 liters of MtDew to bring home. Here in Turkey I go without, but when I am back home my reason for doing so is gone. Good article, good read so I am going to reblog this one for you. I applaud your resolve. I do not share it. Like many the world over, I revere the animals who feed my flesh. However, I would not, could not kill for sport. I’m happy you can live without meat. I cannot. Not all meat, just pig. I eat plenty of sheep and cows and chickens. My Q — What makes you think this? This is my way of saying that bacon is one of the most heavenly tastes we can experience here on earth. It is intended as gross exaggeration.